People often ask me how much time is too much. Given that screens have become so pervasive in every place and aspect of our lives, I think that a better way to look at it is all the places and times you decide not to allow screens. Where in the house, in school, outside, might not be great places to have a screen, or at least a cell phone? 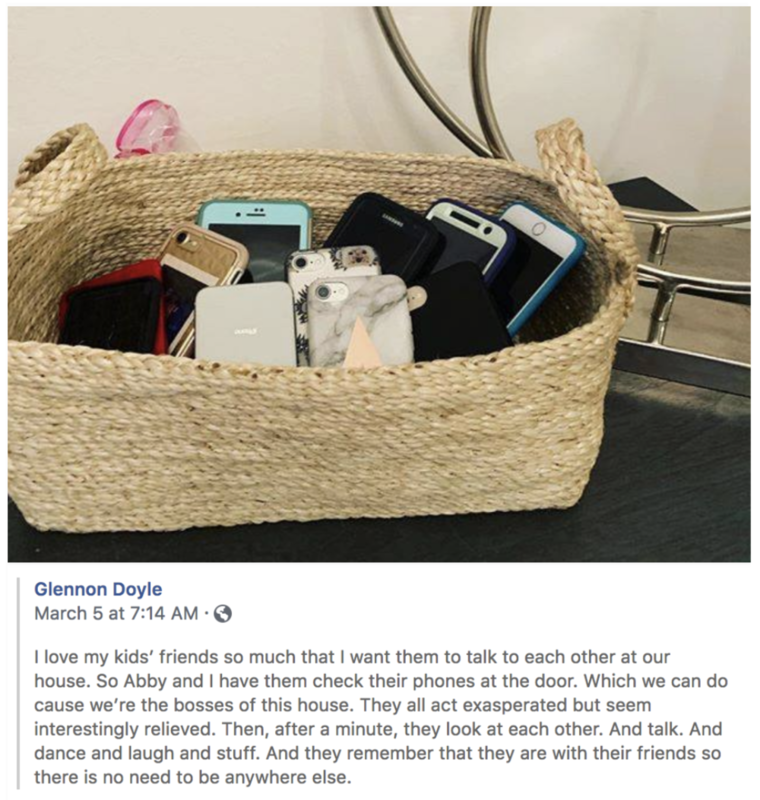 Glennon Doyle, who writes on the merits of being honest and purposeful, posted this picture above on Facebook last week sharing with her fans that when her daughters’ friends come over, they have to deposit their phones in a basket. When my daughter, Tessa, was younger and she had sleepovers, we would agree beforehand on a reasonable time for devices put away, usually around 11:30. She would tell her friends about the policy before arriving so I wouldn’t embarrass her. Because at 11:30 they would rarely shut off the devices on their own, I usually had to come in to collect them. I always got the sense that at least one or two of them were partly relieved when I put the devices to sleep. Three years ago my family decided to make car time, screen-free time. There is no question that it has been a great thing for our car conversations. It was a bit touch-and-go when we started. When my kid’s friends would get in the car, I would gently tell them that we have a no cell phone policy in the car. At first, my kids were embarrassed that I would say this. But through our family conversations where we discussed the benefits of such a policy, over time they stopped being annoyed, and they don’t mind my telling their friends—seriously, they don't. There are clear safety reasons why fewer distractions in the car are good. Distracted driving now causes more accidents than drinking. And yet it is not just about safety. In Australia, a recent survey conducted of a thousand families found that 95% of parents believe a car is a place where kids can open up, and the family can bond. Yet, the parents in the study reported that more than 75% of their children are often on a tablet, phone or other screens, while in the car. It might be fun to share these cell phone free bans with your kids as a conversation starter: ** On the left side there is a vertical sharing bar and if you click on the printer icon you can print this TTT and bring to the dinner table or any other place you will talk with youth about the TTT. Honolulu doesn’t allow people to be looking at their phones while crossing the street. The City of Montclair, in California, liked Hawaii's idea so much that they passed an ordinance last year too. In Chongqing, China there is a 100-foot “cellphone lane” for people who use their phones while walking. France has banned cellphones in schools for kids up to the age of 15. Can you think of rules that some of your friends have in their homes that we do not have? Do you think it is embarrassing when a parent enforces your own family’s rules when your friends are around? If you were a parent how would you handle such a scenario? We would love for you to share this TTT any way that works for you, whether that’s on social media or via a newsletter. If you want to send it out in your newsletter we just ask that you credit us and link to our website, and let us know at lisa@screenagersmovie.com. HOST A SCREENING to help spark change. Do you organize professional development in schools? We now have a 6-hour, 3-part training module. Request more information here Professional Development. Stay in touch with the Screenagers community on Facebook, Twitter and leave comments below. Do you think adding an Instagram filter counts as creativity?